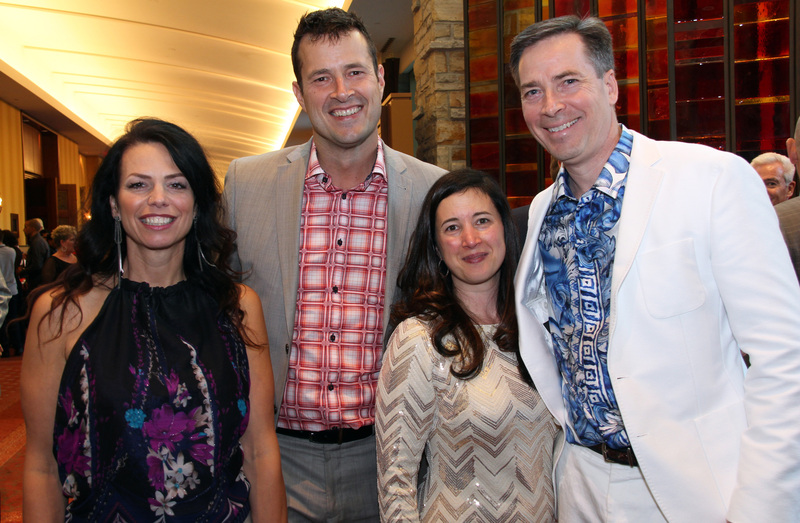 The Ottawa Regional Cancer Foundation was fortunate to have a committed group of businesspeople in its corner for this year's Fight for the Cure, a popular charity boxing fundraiser that leaves participants at risk for a public pummelling. Not only did the businessmen-turned-boxers expose themselves to pain and injury but they also collectively raised tens of thousands of dollars for local cancer research, clinical trials and cancer coaching. The gala raised a net $125,000 and brought together an impressive turnout of about 900 to the Hilton Lac-Leamy in Gatineau on Saturday for a gourmet dinner, followed by white-collar and amateur boxing. The gala's claim to fame is having Justin Trudeau beat Sen. Patrick Brazeau in a matchup, in 2012. In the heavyweight category, Kammal Tannis from Tannis Food Distributors was pitted against Jim Carty, senior advisor and broker with Cresa, making for a fierce fight that ended nicely with a hug. Shawn Hamilton, managing director of CBRE Limited put his dukes up against Sean Cavanagh, a manager of software development and quality teams at CENX. Micheal Burch, managing partner of accounting firm Welch LLP, competed against Steve McBurney, client services director at Robert Half Management Resources. It was a battle of the networks between CTV Ottawa anchor Stefan Keyes and Radio-Canada sports journalist Jonathan Jobin. Organizers are looking to add female participants to next year's event. The men trained twice a week for the past six or seven months with Scott Whitteker. He, by all accounts, went above-and-beyond as director of Fight for the Cure. He took over the volunteer role from his brother, Matt Whitteker, from Assent Compliance. He co-founded the event and fought as an amateur boxer that night (and won). Appearing on stage were such celebrity athletes as Ottawa Senators captain Erik Karlsson and Ottawa Redblacks centre Jon Gott. The audience was packed with people from the business community, including Larry Bradley and Pat Kelly, co-owners of presenting sponsor Heart & Crown Irish Pubs. Hosting the event was former cancer foundation board chair and white-collar boxer Walter Robinson. The evening wasn't all about the sharp jabs, uppercuts and left hooks, though. The audience also learned about the men's personal cancer stories. Burch was just a kid - about eight years old - when he lost his father to cancer. He’s also had many friends die from the disease. The Ottawa Regional Cancer Foundation is his firm's charity-of-choice. His competitor, McBurney, agreed to fight because he wanted to raise awareness and funds for cancer research after his wife was diagnosed cancer. He’s happily married to Melanie Adams, who’s often in the public eye as the president and CEO of the Queensway Carleton Hospital Foundation. “This is his moment to shine,” Adams proudly told OBJ.social prior to the fight. If there’s a silver lining to the diagnosis, she said, it’s been watching the white-collar boxers devote so much of their time and energy toward a cause they believe in. “Steve really has been an incredible role-model in our family,” she added. Adams has advanced stage three melanoma and has started her 49 weeks of treatment. McBurney won his match against Burch. He felt "awesome, awesome, awesome" when Robinson asked him afterwards on stage how he was doing. That wasn't quite the adjective Burch had in mind when posed the same question. "Not as well as [Steve}," he replied good-humouredly. Proving himself a powerhouse, both in the ring and as a volunteer fundraiser, was Tannis. He raised close to $25,000. He also won his fight against Carty. "He hits like a truck," a breathless Carty told Robinson in the ring afterward. Learning how to box happened to be on Tannis's bucket list when he was first asked to take part by the cancer foundation’s vice president of philanthropy, John Ouellette. “I have wonderful family, friends and businesses associates, and as soon as they found out I was boxing, they said, ‘We’re in’,” said Tannis, who sold a tonne of tables and raked in donations. One of the benefits of participating in Fight for the Cure was that many of the competitors saw an overall improvement in their health and fitness, due to their training. Keyes -- who worked with a nutritionist to become a lean, mean fighting machine -- said all he wanted was a cookie after his fight was over. “A M&M cookie from Subway would be golden,” he specified.